Sang, J., Riku, S., Aisawa, S., Hirahara, H., Mori, K.
A simple, direct adhesion method was developed to join polyamide (PA6) to hydrogenated acrylonitrile butadiene rubber (HNBR) by grafting a functional layer of a silane coupling agent on plasma functionalized PA6 surfaces. The functional layer of the silane coupling agent was prepared using a self-assembly method, which greatly improved the heat resistance of PA6 from 153 °C up to 325 °C and the resulting PA6/HNBR joints showed excellent adhesion properties with cohesive failure between PA6 and HNBR. X-ray photoelectron spectroscopy (XPS), transmission electron microscopy (TEM), and nanoscale infrared microscopy and chemical imaging (Nano-IR, AFM-IR) were employed to characterize the surfaces and interfaces. The Nano-IR analysis method was employed for the first time to analyze the chemical structures of the adhesion interfaces between different materials and to establish the interface formation mechanism. This study is of significant value for interface research and the study of adhesion between resins and rubbers. There is a promising future for heat-resistant functional layers on resin surfaces, with potential application in fuel hose composite materials for the automotive and aeronautical industries. 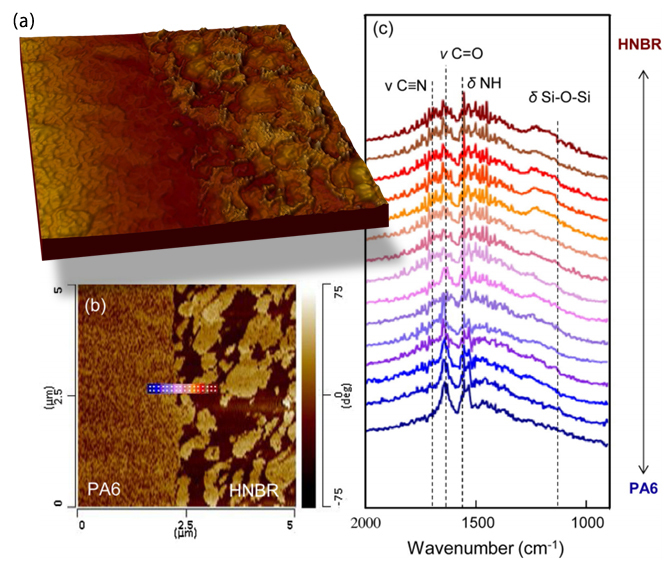 IR chemical image and spectra of PA6/HNBR(APTMS-3) cross-section – (a) AFM height image, (b) AFM phase image, and (c) nanoIR spectra.